Last week I had some picks for what to acquire now that Kaladesh block is FINALLY rotating. 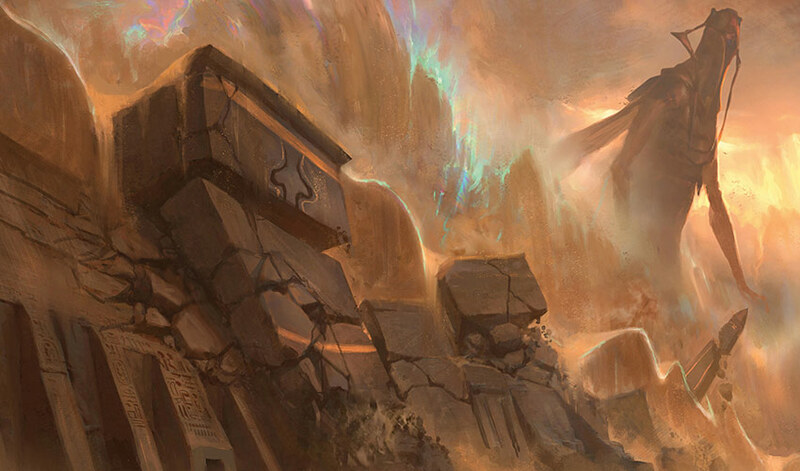 Amonkhet is also going, and this is our chance to pick up some cards dirt cheap. I’ve got a combination of cards that are already good but underpriced, the casual foils I am targeting, and the spec cards that might not be worth much now, but in a world where Wall of Kelp is $10, anything is possible! First up, Amonkhet, and then Hour of Devastation, the last small set we’re ever going to have until Wizards decides to go back to this model in two years. There’s a few fringe decks using this, and it caused several of the nonexistent-mana-cost cards like Restore Balance to spike hard. What remains true is that this is a unique and powerful engine, and it’s a mythic that would be a four-of in the deck trying to break it. Eventually, it’s going to get broken. Someone will figure out a new combo, or a new card will be printed that makes this a totally ridiculous play. It’s not a big casual card, being in 3700 decks on EDHREC, but I want to have some of these for when Modern brewers make this the new terrifying play. Whenever it happens, I’d expect the nonfoils to hit $20. First of all, these foils are too cheap or the nonfoil is too expensive for the current prices. The ratio doesn’t line up at all. I’d expect this to either be $3 nonfoil or something like $15-$18 in foil. Frankly, I’m not sure which it is, but I’m super-in on foils at this low price. It’s in 6700 EDH decks, and that’s not bad for such a recent card. Compare to Parallel Lines, which is $18 and in 14,000 decks online. I think that’s a case of reverse recency bias, where older cards have just been around for a longer time, building up fans and decks. White is very good at making tokens, and I think the foil is due to correct upward by at least $10. There’s 80 copies on TCG, compared to 60 foils of something like Soul-Scar Mage or 200+ for Prowling Serpopard. I’m hoping that the rotation in October floods the market a little on this card. 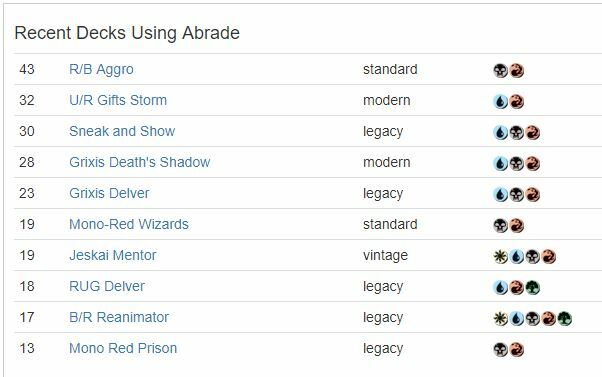 It’s seeing just enough Modern (UR Wizards) and Legacy (UR Delver) to be worth putting a few copies away, I’d just like to get in as cheap as possible. The reason both of those decks are running this card is because it’s a one-drop with Prowess, so a deck stuffed with cheap spells and interactions is going to have a field day with this. I would prefer to get in at $1 or less, or hopefully $3 on the foils, but there’s a good chance that we are at the bottom for this card. It’s done a lot of coming and going, as the graph shows, but I’m hoping that people dump their supply. This is another card where the prices just don’t line up. There’s 120 nonfoils on TCG, and 60 foils, so there’s not a huge gap in supply. 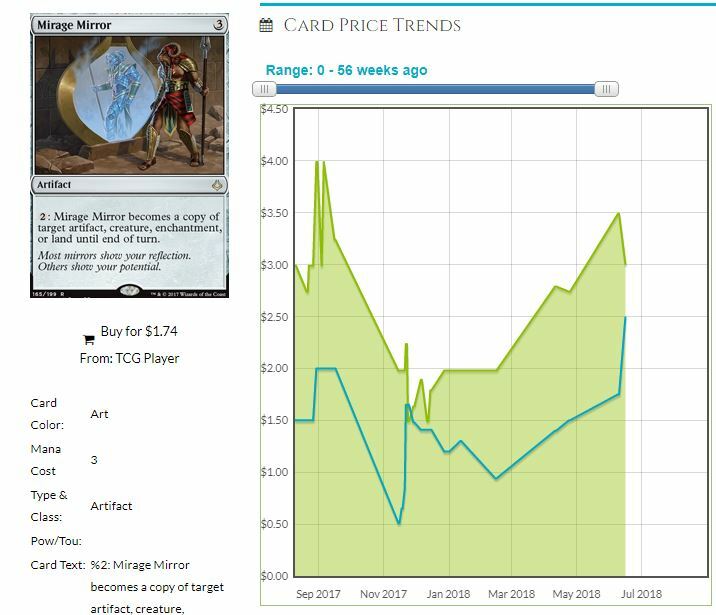 A price like this makes me think that the card has been carving up Standard, and people are playing the foil and the nonfoil at almost an equal rate. I can’t find any decks with this doing well in Standard, either. Regardless of why (I wish I knew but shrug) the important thing is that the foils seem quite underpriced. It’s a much better Regal Bloodlord, triggering every turn and making a more powerful creature. There’s no Horse tribal synergies yet, so I’m just going to scoop up the foils at or under $10 and store these away. It feels like the foils will have a better growth pattern than the nonfoils, so that’s what I’m pursuing. This is a pickup because it’s stunning in Commander games. It is a hasty clone effect, it can copy their Mirari’s Wake, or even pull a Thespian’s Stage and get you a Dark Depths 20/20 creature! Terrible on its own, but in a Commander pod? I am consistently impressed by this card, because it offers maximum flexibility and it gets used over and over again. Please, just go try it. You’ll be amazed too. I think this is a lock to end up in a Commander set sometime in the next couple years, and that’s why I strongly advocate you get foils now. Something’s going to happen and it’ll spike to $20, easily. I like this one for the amount of play it’s getting in Tron maindecks. It’s only a one-of currently, but in decks that are heavy on the colorless mana AND have 8 land tutors (plus a set of Ancient Stirrings) it’s pretty great to have this available game one. It’s notable that decks are playing this over Bojuka Bog, which might have been your first thought, but here we are. It’s not a heavy player yet, but I’ve seen this do a lot of work in Commander for not a lot of cost, and can be re-used if there’s more than one desert in the deck. The Game Day version of this card is sweet, but have you seen how many non-rotating decks play at least one copy in the main or sideboard? It’s so flexible, offering a lot of decks a lot of options. I don’t mind that several of these decks are playing just one in the board, as I’m going for the foils. 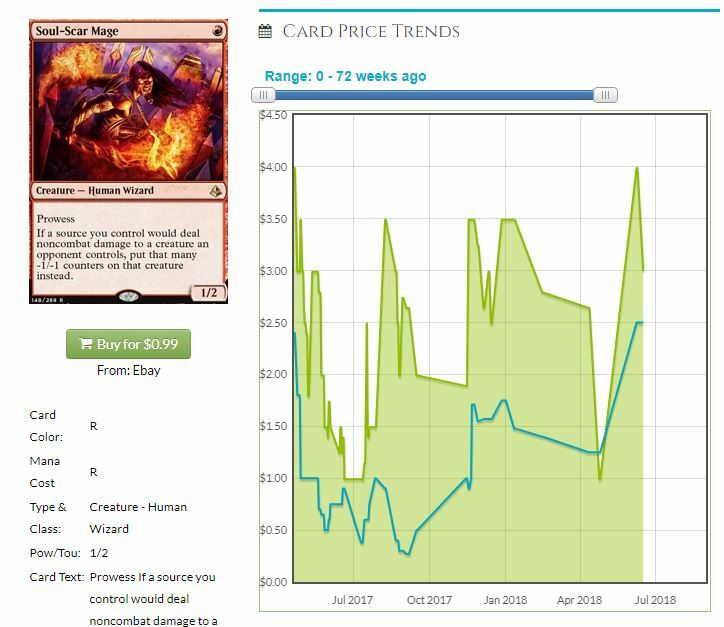 There’s only 40 foils on TCG at the moment, and that’s a surprisingly low number for an uncommon printed just a year ago. All of these point to a moment when the card tips, and I don’t think that time is far away. I also think that it’s not going to do a small jump–this will be a $25 card. Don’t sell when it hits $15. Cliff has been writing for MTGPrice for five years now, and is an eager Commander player, Draft enthusiast, and Cube fanatic. A high school science teacher by day, he’s also the official substitute teacher of the MTG Fast Finance podcast. If you’re ever at a GP and you see a giant flashing ‘CUBE DRAFT’ sign, go over, say hi, and be ready to draft.